In today’s business world, there are few corporate clubs more elusive than being known as a “top place to work.” Organizations with the reputation of having a great work culture continue to attract top talent and thrive, while others with toxic or mundane cultures struggle mightily to transform themselves, often to no avail. Silicon Valley has become the vanguard of spending money to lure top talent — with kegerators and ping pong tables seemingly a base requirement for startups hoping to garner a competitive workforce. But it’s becoming increasingly clear that company culture can’t be bought or manufactured. Instead, it is embedded in an organization’s DNA, built over time by the people who work there. In this Trep Tip we will look at three key drivers that help define organizational culture, and highlight companies who have become leaders in their industries by placing culture front and center. The first building block to establishing a healthy company culture is clearly articulating the purpose of your company. In a past Trep Tip, we discussed the importance of a “vision”, and how it allows companies the flexibility to innovate as the market changes without losing their core identity. Staff understanding and buying into the purpose of your organization will do more to sustain staff engagement than any bonus or performance-based commission structure. What’s more, a clearly articulated purpose does your recruiting for you, attracting like-minded job applicants who are already invested in building your vision. REI has been a purpose-driven organization since its inception over sixty-five years ago. The couple that started REI had a clear founding idea: a commitment to high-quality outdoor gear that came from their love for mountains. This purpose, to “inspire, educate and outfit for a lifetime of outdoor adventure” has remained at the core of the company, even as it has scaled into a $735 million business. REI’s purpose is more than just a sentence on a page. The shared love of the outdoors is reflected throughout the company’s policies. Employees enjoy steep discounts on apparel and receive two paid days off — called “YAY Days” — to enjoy their favorite outdoor activity. REI also offers challenge grants, where team members can apply for company funding to support individual or team or outdoor challenges, everything from bike rides to climbing Mount Everest. These incentives not only boost employee morale, but also reinforce the existing culture (an additional benefit of policies is that they have become brand-reinforcing marketing and PR opportunities). By having a clear purpose as an organization, and reinforcing it through company incentives, REI attracts like-minded people who buy into their vision, which has propelled their growth and earned them customer loyalty. Key Questions to Consider: What is the purpose of my organization? 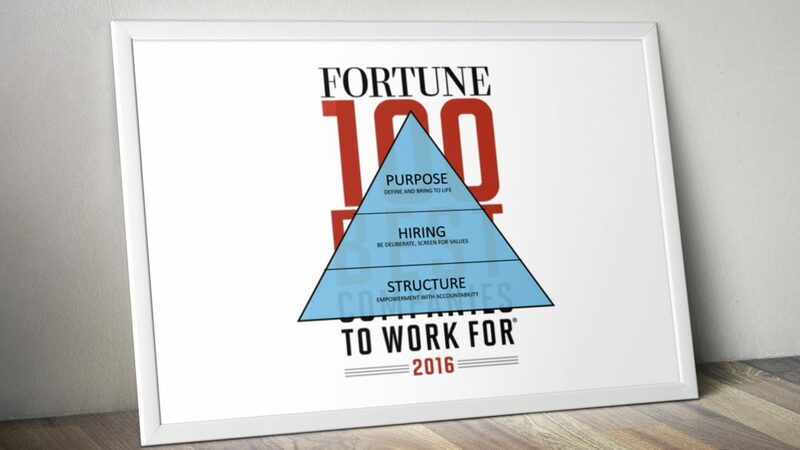 How can I align employee incentives to reinforce that purpose? Cultures are created by people. The minute you hire your first employee, a culture is born, and with each successive hire that culture evolves. Because of this, one important driver behind an effective culture is establishing a company-wide value system. Just as people have value systems that govern their decision-making, it is vital that every company have a shared set of unifying values that can inform employee behavior and guide decisions around hiring. Key Questions to Consider: What do I value above all else from my employees? How do I evaluate that criterion when hiring? Just as there isn’t any one “ideal culture,” there is no organizational structure or management style that will universally get results. However, the best cultures are ones in which employees are accountable for their actions while simultaneously feeling empowered to add value wherever they can. That responsibility also comes with a high level of accountability. Almost everything that happens within each Whole Foods is meticulously measured, and team and individual performance is closely tracked by reviews from other team members. Positive results are expected, and employees are not just judged on what they do, but how they do it. (A great first step towards including behaviors in performance management is to include the company values we discussed above as line items in performance management reviews). This type of empowerment and accountability has allowed Whole Foods to remain on the Fortune’s list of the Best 100 companies to work for six years in a row, and has been a boon to their balance sheets. With $2.7 billion in revenues and net profits double the industry average, Whole Foods is a compelling example for organizations considering to what level they should decentralize responsibilities. Key question to Consider: How can I structure my company in a way that empowers employees? Does my system for performance management address both what employees get done as well as how they get it done? There is often much truth to be found in the history of words. In Middle English the word, culture, meant “place tilled.” All the way back in Roman times, the philosopher Cicero used an agricultural metaphor “cultura animi”, to describe the development of a philosophical soul. Just as the farmer cultivates his crops over time, so too must the dedicated manager or owner work every day to build the culture he desires. And just as the dedicated agrarian views farming as more than just a necessity in order to harvest, so too must we consider the mission of building an organizational culture as much more than a task to be checked off a list, but rather as an undertaking that can be a reward in itself. There is no silver bullet when it comes to building an organizational culture that will attract and retain talent. But the best ones start with a well-defined purpose. Then, through deliberate and values-based hiring, organizations can build teams of people that live and breathe the organization’s purpose, reinforcing this through values-aligned rewards. Finally, as organizations scale they must ensure they do not become overly hierarchical, and structure themselves in a way that empowers employees while maintaining accountability. By following these three tenets, and borrowing best practices from industry leaders like those highlighted above, any organization can put itself on track to build a vibrant and resilient culture. Since moving to New Orleans, Kevin served as an Entrepreneur-in-Residence and COO during The Idea Village’s 2012 and 2013- Entrepreneur Seasons. Kevin has built a strong team of entrepreneurial specialists who have worked with over 500 entrepreneurs and startups collectively in New Orleans, our headquarters and the number one city for startups per capita in the United States.